Langland Bay is a designated Conservation Area with 75 Edwardian Beach Chalets overlooking the Bay. Excellent for families, Langland offers a superb stretch of sandy beach that is very popular with bathers and surfers. Other facilities include a café and tennis courts on the foreshore. Langland Bay holds a Blue Flag Award (2016) and is patrolled by lifeguards during the summer months. Always check the weather and local conditions before going in the sea, as some Gower beaches experience strong tides or currents. To attain a Blue Flag, a beach must reach the highest recommended European bathing water standards and the beach must be clean, well managed and promote sound environmental management. The Blue Flag Campaign looks at resort beaches and marinas. The Campaign has been running since 1987 and is recognised in 22 countries. Langland bay itself is popular with families and can be quite busy in summer, when the sun shines. It is also popular with surfers. In winter it's nice to take a stroll along the beach and then warm up with a hot drink in the cafe. Sea/ coastal views are particularly pleasant. The coastal flora is particularly interesting throughout the seasons. -	Tennis courts are free and open to use during the winter months (Oct to March inclusive) but there is a charge and booking required during the summer (April to September inclusive). Bookings through the Outdoor Leisure Section of the City and County of Swansea on tel: 01792 635142. Open access except to tennis courts which need to be booked between April – September. Car: Road to Langland Bay off B4593. Car parks on site. Website link: Why not take a look at Langland now via the webcam! 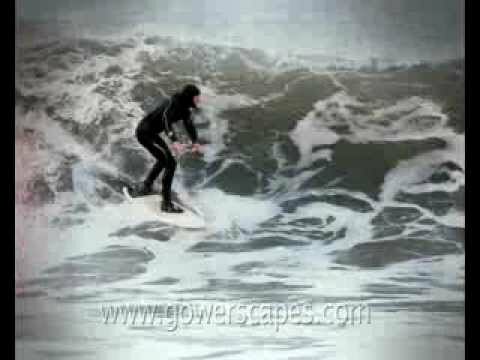 This shows some guys surfing in Langland Bay and the vid is by Gowerscrapes and taken off youtube.